I am a Ph.D. candidate at Indiana University studying Microbiology and Ecology. I am fascinated with microbes and how complex these ‘simple’ organisms can be. Specifically, I’m interested in how microbiomes interact with hosts and the consequences of these interactions. I’m excited to be researching one way bacteria interact with their hosts through quorum sensing, or bacterial communication. 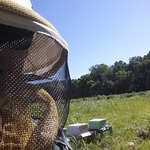 I’m hopeful that this research will help us better understand how bacteria affect the health of the honey bee and how it can be applied to other organisms.